This St. Patrick’s Day, you will be flooded with images of four-leaf clovers and leprechauns. Your diet may consist of primarily chocolate coins and Guinness, but this St. Patrick’s Day we need to give a shout out to an unsung hero of Irish cuisine. Cabbage became a very important food staple in Ireland during the Great Potato Famine, and since, corned beef and cabbage has become a classic Irish-American St. Patrick’s Day meal. Despite the traditions, cabbage is more than just a food associated with corned beef and St. Patrick’s Day. Cabbage has a very interesting history, as well as fascinating traits to help it survive. Cabbage is a part of the Mustard family, Brassicaceae. This family of herbaceous plants is huge and very diverse, with around 3500 species of plants. The most well-known part of this family are the Brassicas, this is the group to which the cabbage belongs. The cousins of the cabbage in this family include broccoli, cauliflower and kale which together make up a group we know as the cruciferous vegetables. 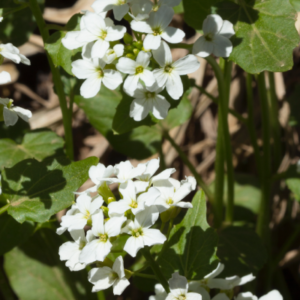 It is thought that all three of these plants came from the wild mustard plants and with slight adaptations to each of the members of the family. There are tons of wild mustards that grow wild locally, although most are fairly small and nondescript. Some of the relatively more flamboyant members of this family that can be found in our valley include brookcress (pictured) and wallflowers. Mustards bloom throughout the summer and you can find these (usually) tiny, flowers with four petals throughout the valley. In addition to having interesting relatives, all of the Brassicas produce a variety of chemicals that help them survive. One of the most interesting usages for these plants is the use of a chemical called a glucosinolate. Glucosinolates are used to deter animals that eat the leaves of these plants. As an animal chews up the leaves of one of these plants, the gluconsinolates are released and they combine with other chemicals in the plant. This combination starts to break down the glucosinolates, which is what perturbs the herbivores. The products of this breakdown are toxic, and they have a variety of effects on animals such as reducing the thyroid, and messing up hormones, detrimentally effecting mucous membranes, and depressing the growth of the kidney and liver. So why on earth do we eat plants like these? Multiple studies have shown that although cabbage and its relatives are technically toxic, when eaten in moderation, the glucosinolates actually have a lot of health benefits. Cabbage for example, has a variety of health benefits including improving blood flow, benefiting the nervous system, and even helping to lower the risk of colon cancer. It has been shown that cruciferous vegetables, as a whole, help boost the immune system, fight heart disease, and help to prevent cancer. So, this St. Patrick’s Day, maybe we should take a page out of the Irish’s book and fill our stomachs with some delicious and nutritious cabbage! Caitlin Carroll is a naturalist at Walking Mountains Science Center in Avon. Join us for free nature walks Monday-Saturday at 2:00 pm!